Many people concerned with an environment housing a beautiful and wonderful. Environment that can be built from the home garden. A page that any land we have, we can treat it as a park. Does not actually own the garden can only be made on the open land. Parks can be made in the room. People know the park like this in the garden. In the garden can be built on the open area in the room. For example innercourt on or in the open space in the building. Size innercourt it should not actually be trouble. It is important, inncercourt function as the exit and entrance of air into the building can be a maximum. Now, to maximize its function, can be made on innercourt dry garden. There is a park on innercourt can help the air circulation in the house. Innercourt work on the garden, among others, provide a supply of fresh air on the inside of the house. Innercourt can also give the air temperature difference, so it can push hot air outside the building. 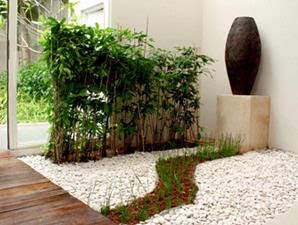 To create a garden on innercourt is actually no need to confused. Type of plants do not need much. A maximum of 2-3 types of plants. In addition consideration will ease maintenance, the garden created in order to harmonize the concept of minimal modern dwelling. The rest, you can add other elements such as types of natural stone or coral stone broken times. For more beauty, you add other elements such as gentong. If enough land, make a mini swimming shower as nuance through the sound of water.